Lothar Orbach was just 14 when the Nazis began rounding up Berlins Jews. When the Gestapo came for Orbachs mother on Christmas Eve 1942, they escaped with false papers and Orbach entered Berlins underworld of divers. He was eventually betrayed and sent to Auschwitz, on the last transport, in 1944. 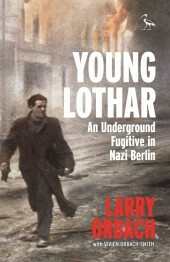 This coming of age story is a story of hope in the very heart of darkness.Lothar Orbach, the youngest son of a German Jewish family, was just 14 when the Nazis began rounding up Berlin's Jews. His promising education was aborted; his close-knit family splintered. When the Gestapo came for Orbach's mother on Christmas Eve 1942, they escaped with false papers; his mother found sanctuary with a family of Communists and Orbach - under the assumed identity of Gerhard Peters - entered Berlin's underworld of 'divers'. He scraped a living by hustling pool, cheating in poker and stealing - fighting, literally, to stay alive. Outwardly he became a cagey amoral street thug, inwardly he was a sensitive, romantic boy, devoted son and increasingly religious Jew, clinging to his humanity. In the end, he was betrayed and sent to Auschwitz, on the last transport, in 1944. This singular coming of age story of life in the Berlin underground during WWII is, in essence, a story of hope, even happiness, in the very heart of darkness. Unser Kommentar zu "Young Lothar"